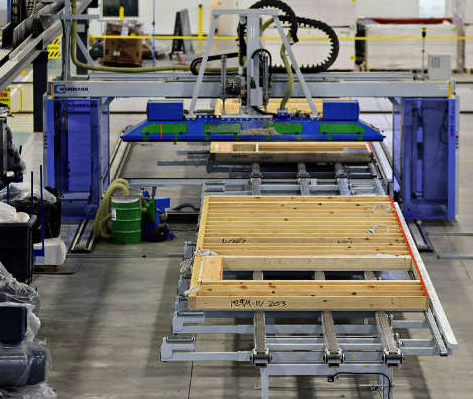 Aerospace Robotic Panelization is a progressive construction process brought to the market by PFP to create properties unlike anything in residential construction to date. PFP homes incorporate unrivaled precision and structural integrity, including dimensionally flawless roof, flooring, and wall components, and can be built in customizable architectural styles adapted to any scale or environment. By using premium lumber imported from Finland, air pressure packed r-value insulation, and the most efficient premium mechanical, electric, and plumbing material available, PFP ensures that your home’s structure, finish quality and energy efficiency will surpass that of traditionally built homes and increase your home’s value well into the future. The fully custom, closed-wall panels used in PFP homes are created in a 200,000 square foot state-of-the-art facility. Buyers are invited to the facility to witness the creation of their home’s walls, floors, and roof. In-wall elements, such as plumbing, electricity, and insulation are then added, and windows and doors are placed into the panels prior to delivery, ensuring optimal fit and energy savings. While robotics are used for the majority of the building's construction, every section of the home is carefully scrutinized by expert technicians and field inspectors trained to monitor and correct even the smallest defect. Panels are not released from the factory until every inch of material is rigorously inspected and approved. Once complete, panels are carefully loaded for transport and delivery to the prepared site, where they are assembled in just a few days by our installation specialists. While traditional homes are constructed from the ground up on site, panelized homes are assembled from components that have been created in a tightly controlled factory setting using sophisticated robotic technology. The panels are then transported to the site, where they are assembled and finished. The process is fast, energy efficient and cost effective. WHAT ARE THE BENEFITS OF PANELIZED HOUSING? The factory process allows for the highest degree of precision and dimensional accuracy. Top quality materials are used, ensuring a finished product that is stronger and more efficient than traditionally built residences. The process can be completed in a fraction of the time it takes to construct a site-built home; panels can be manufactured while the site is being prepared, then delivered to the location. Once there, the shell of the home can be constructed within days. In addition, panelized homes are environmentally friendly. The tightness of the construction eliminates energy waste and reduces heating and cooling costs, and the speed of the process reduces the risk of weather damage during construction. The precision and quality of construction means lower maintenance costs. DO PANELIZED HOMES APPEAR DIFFERENT FROM TRADITIONAL HOMES ON THE EXTERIOR? No. Panelized homes are indistinguishable from homes built completely on site. All architectural plans can be adapted for panelized building, and the homes can be built in contemporary or traditional styles and customized according to taste. Traditional siding, stucco or brick can be applied to the exterior and interior finishes are applied in the same manner as with site-built homes, reflecting the individual tastes and preferences of the owners. ARE PANELIZED HOMES THE SAME AS MODULAR AND MANUFACTURED HOUSING? In a word…No! While all three categories are largely factory constructed, the flat walls and floors (the panels) of a panelized home are built off-site, delivered to the location and set in place by cranes. The architecture can be customized, as the panels can be built to any dimension and allow for maximum design flexibility. By contrast, “modular homes” are composed of pre-built box-like sections. That means they are limited in size and require multiple trucks for delivery. Generally, modular construction does not allow for extra structures such as porches and garages to be built in the same factory. The term “manufactured housing” generally refers to mobile homes, or residential trailers, intended for temporary habitation, constructed on steel frames and shipped on wheels to be set down on a concrete slab. WILL MY PANELIZED HOME HOLD ITS VALUE? Absolutely. Like the highest quality homes constructed on site, panelized homes will grow in value over time. In fact, due to the strength of construction, the efficiency of the process and the superior quality materials used, panelized homes are likely to last longer than many site-built homes.